Black and Brown communities are terrorized by police on a daily basis on a physical and emotional level. We are all too familiar with the physical terrorism: bodies being slammed on pavement with knees penetrating necks, batons beating against skulls mimicking a life-size piñata that spills blood instead of candy and, last but not least, the iconic image of a body riddled by a volley of bullets. But the emotional terrorism, which the police are well aware of and use to their advantage, is displayed every time the mere insignia and symbols of the police solicit a response contrary to how the denizens would normally react if they hadn’t heard the sirens or seen a police car. Poor communities of color fear the “mythical reality” of police oppression and thus become organized into an ideology of fear that enables uniforms, badges, sirens etc. to become just as frightening and controlling as a raised baton. I use the term “mythical reality” because there is a narrative that comes to the aid of police oppression that adjusts the lens so that the legend of police as heroic men and women, out-manned and denigrated, fighting against villains who are attempting to undermine the fabric of America, is perpetuated continuously. This legend is solidified not only in the mainstream of America’s upper and middle class communities, but also in the poor communities being oppressed. This is usually expressed in the generation gaps, where a grandmother’s or a mother’s desperation forces them to call the police oppression and brutality into their communities as a retributive parenting tactic that backfires when their children are gunned down by the police in an attempt to cleanse the neighborhood. Before we seek to mobilize an uncompromising rectitude of this “mythical reality,” we must seek to understand our current perspectives of the police and their prescribed role in poor, Black and Brown communities and demand that the current perspectives be aligned and compatible with our communities’ goals and vision for our neighborhoods, our children and ourselves. What role, if any, should the police play in Black and Brown communities? Have they earned the packaged “reverence” bestowed upon them by the media and power structure who have a vested interest in our being subservient to that “reverence” – even if by the time it is translated in our communities it becomes the police oppression that we have allowed to find refuge in our own expectations? What value, if any, is re-enforced and recognized as intrinsically belonging to the poor minority communities? When the police break from their ideological huddles and ride out to the ghettos, what re-enforcement of values, what philosophy of education are they carrying in their holsters, and in what ways have they chosen to institute this education in the community? The nucleus of this essay is a question that seeks and searches its own imperatives to birth unto itself an edifying perspective; and that question is: Do Black and Brown communities owe themselves the task of searching their perspectives of police oppression and aligning those perspectives with empirical experiences and historical narratives of police and how they have responded to the community? “So common and accepted, so significantly mundane is the brutality of the police against raced communities that the reality in which they are displayed before us becomes a social hallucination. The racist disposition of the visible, which will prepare and achieve its own inverted perceptions under the rubric of what is seen according to Judith Butler can turn a clear vision of police brutality into a myth of police vulnerability. I would like to point out something so obvious it seems to lose reality in the propensity to take it as a given: The “rebellious youth” terrorizing the Black and Brown communities are the sons and daughters of those same communities. Mothers, grandmothers, aunts, uncles, fathers, grandfathers, you must mobilize into a class of guardians and get your children out of the streets! You can no longer afford to call the police on your children as a first option and then criticize how they choose to operate in our communities. What education does the Black community owe itself in regards to police oppression, violence and brutality? How will Black and Brown communities use this education to re¬negotiate the context, organization and terms in which the police utilize their resources to serve, protect and communicate with the community? The brevity of this essay is intended to keep the reader oriented towards begging questions that will demand the police recognize a more self-determined community. What would happen if the demand for police oppression dissipated and communities organized themselves and their “rebellious youth”? What role, if any, should the police play in Black and Brown communities? What education is re-enforced in police jurisprudence? If we do not have the courage, fortitude and indignation to grapple with these questions sincerely and usher in a new perspective, our communities will continue to be extended training grounds for the “mythical reality” of police oppression. Note: I define the term “mythical reality” as a situation where one class of people, usually the lower class, knows a reality, usually violence, racism, prejudice etc., to be true by experience, while another class, usually the upper class, tries to control the perception and narrative of the other class by forms of control offered by their privilege. 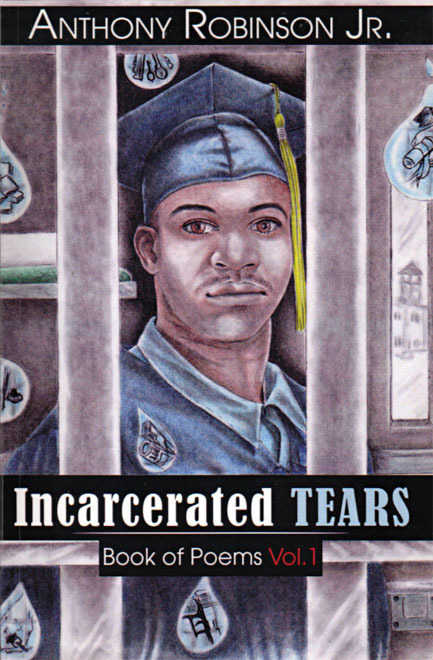 Anthony Robinson Jr. is the author of “Incarcerated Tears: Book of Poems Vol.1,” which can be purchased at www.BuyBooksontheWeb.com or by writing to him. Send our brother some love and light by writing to Anthony Robinson Jr., P-67144, NFORK AN-156, 1605 E. Main, Sayre, OK 73662. Now 28, he has been locked behind enemy lines for over a decade. When the 'just-us' system has two set of laws, one for them and the police and one for the 'unwashed' masses, there is a problem. When they write cockamamie laws, the respect for law drops. When they enforce unconstitutional laws, they are going to have a problem brewing under the skin. When they brutalize people for victimless crimes and for social issues, there will be a problem. If they ever brutalise me or my family members, and get away with it like usual or use a torture device on us, that will be it, it will be open season on all and any police or just-us official. You cant fight them in their club of courts which you are not a member. Oppression as a policy has to go, and right now. My line in the sand is drawn, where is everyone elses? Unless this policy of protecting these animals stops, they will be sowing the seeds of their own demise, and just following orders is not going to cut it. When the cops cause a massive retaliation against them for their looting and thuggery, I hope the oath keepers get out of the way. Good cops are hard to come by, we will need to get these oath keepers back into their jobs as soon as the garbage is taken out. Enforce an unconstitutional law = you should be hung from a public lamp post for all to see. If you want to call extreme, heh, it will take something extreme and out of the control of these wannabe controllers to change anything, you cant win fighting with their rules, they are rigged to make sure you are at the mercy of whoever is trying to get you to lick their boots. They need to be put back in their place as servants, not masters. They also will not willingly give up that power, it has to be taken since all the laws and rules are designed to be manipulated by them in their favor, just for that reason. And if you think these issues are localized, think again, our government is at war with we the people, they want ALL the power and wealth and for you to just shut up and do as your told. As for those who film the police breaking the laws, good, however, they fight that as well, how dare you point out anything not in lockstep with their PR firms. People need to start getting involved, if you see someone being brutalized, jump in and help, make a citizens arrest of the cop involved, remove his gun and badge and hand cuff him. If this doesnt work, which it is doubtful since cops do no wrong apparently, just eliminate them and make sure all the witnesses saw nothing. Maybe their own medicine will wake them up. In order for all communities to come together and combat these institutions designed in division of divide and conquer, we must disengage from police, themselves. At POOR Magazine, we soundly refuse to EVER call the po-lice. Yes, we call renamed this culture with that hyphen-differentiation/similarization because they crawl all over our lives, 24/7. Yes it takes a village to raise a village. Oppression is a job they get paid for on our tax dollars. They are the arm of government to that effect. Follow this link to my latest article, "No Po-lice Calls…….Ever!"